Charlotte, N.C. and Odense, Denmark—August 22, 2017—On Robot, the fast-growing Danish manufacturer of innovative electric grippers for collaborative robots (cobots), today launched a flexible and energy-efficient gripper for cobots tasked with handling objects of various sizes. 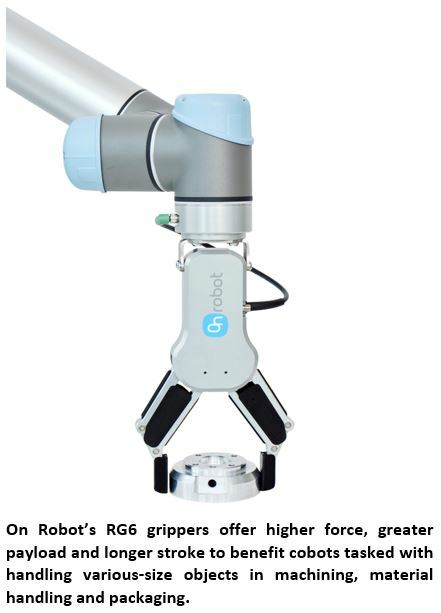 Easy to install on the arm of a cobot and simple to program, the RG6 is a bigger and stronger version of the company’s popular RG2, with higher payload than other two-finger collaborative grippers available on the market today. This higher adjustable force (25N to 120N) enables three times higher payload (6-8 kg or 13.2-17.6 lbs.) and wider stroke (160 mm or 6.3 in. ), ideal for manufacturers automating the movement of delicate or heavy objects in applications such as pick and place, computer numerical control (CNC), machine tending, packaging and palletizing, and assembly. Like the RG2, the RG6 is an electric gripper instead of traditional compressed air solutions that take up large amounts of space, are energy-intensive and too complicated for many users. Compatible with all Universal Robots cobot arms, the RG6—which mounts the arm with factory-installed safety shields—is easy and fast to install, enabling operators to quickly modify assembly on the factory floor without the assistance of an engineer. Simple and intuitive programming that lets operators easily choose what they need the gripper to do, and the gripper then responds with flexible motion. Assisted center-of-gravity calculation that lets users enter the weight of the payload and let the robot calculate the rest. This makes programming easier, enhancing overall productivity and improving safety by enabling more accurate robot arm movements.